At St Bernadette’s our community is based on core Christian values. These values foster a positive learning environment, helping us make decisions about how we behave, create a stronger sense of community and improve our social and relationship skills. They are a guide to how we live our lives, influencing our attitudes and actions, encouraging us all to take responsibility for our own learning and behaviour. Sometimes when we are so busy in life we forget the values that are important. Here at St Bernadette’s we focus on one Christian value per half term to help us understand what living that value actually means and to help us to truly love, serve and grow together with Jesus. 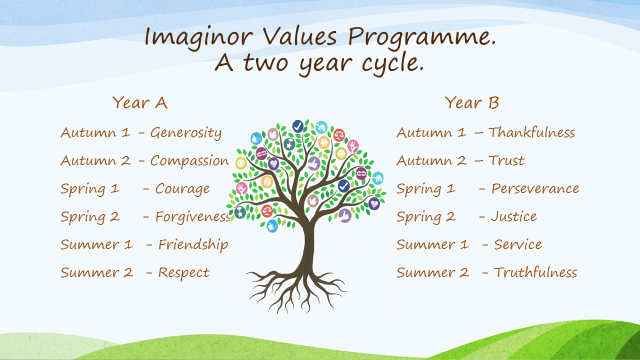 The values programme is run on a two year cycle. There are six values per year with one to be introduced each half term. The Foundation Stage children, enjoy the JACK IN THE BOX programme, with Jack, the loveable Labrador puppet, coming out of his box to engage children in worship. Follow up activities are then suggested to support the value explored in the worship. Key Stage 1 children enjoy, the OSCAR OUT OF THE BOX programme, with Oscar the wise little owl accompanying the children through the worship journey. It is a creative and innovative approach to collective worship with the values themes running through each session. 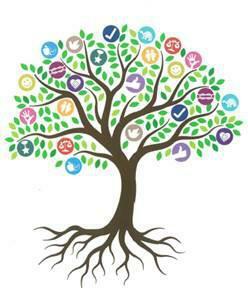 Key Stage 2 children engage with and are inspired by the Roots and Fruits programme of collective worships. The programme includes a range of creative opportunities to develop the Christian vision, values and ethos of St. Bernadette’s. In addition the programme provides a structure for children to become leaders of collective worship. When someone in our school demonstrates that they are living by the Christian values, they have the opportunity to earn a ‘Bernadette Bead’. This ‘Bernadette Bead’ is placed in the relevant ‘Value Vase’ which forms part of the values display in the school entrance. Once awarded a ‘Bernadette Bead’ the children will have this recorded in their diary. They can work towards receiving bronze, silver and gold certificates.